Sometimes the clay is just baked | The Old Adam Lives! Have you ever tried to discuss the gospel with another Christian and all you get in return is a bunch of bunch of “yeah buts”? Sometimes, I believe you just have to leave it (them) alone. Sometimes they are just really into the religious Christian project… climbing steadily, improving their Christian lives, and there’s no stopping them. In such a case I would suggest that you just let them go ahead with their project. And then look for others to share the gospel with. Look for those beaten and battered by life, or their own religious projects. It is here that the law has done it’s job and it is here that the gospel may have the best chance of being heard and freeing the person from the law (what ‘they do’). Every person and situation is different and I do not advocate a formula. But I think the general principle is fairly steady. Thanks to flicker and Dan Squires, for the photo. 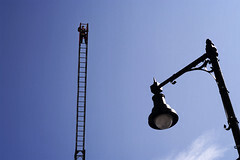 I think we prefer to climb ladders because they are more tangible than a gospel of grace. I think you are right, Charlie. Especially where there’s not any tangible Sacraments for the assurance of our salvation. I think if we are going to do anything with these folks, it might be to pour it on them (the law). So we may get to plant a seed, but we may not even see the sprout – we only see the weeds growing around it and nothing from our seed. And yet, if we were faithful, there is no telling what God will use through His spirit. You are right, sometimes the clay is baked, other times, the plant is just slow. Thanks, Alden. I think there’s a lot of truth in that. A Lutheran pastor friend of mine told me the exact same thing over the phone last night. I guess we ought not get frustrated, or discouraged, but rather just throw that seed, and maybe water now and then. That’s the importance of the law in all of this. The law would not let you rest. And it wore you down to the point of death. This is the legitimate theological use of the law…to kill. You can’t be re-born until you die. So the law killed you, and the gospel raised you again. That’s so much of the trouble in ladder climbing churches…there’s no dying going on. And when someone does get to that point (in those churches), there’s no pure gospel to come in and give them life. There’s only more law, “try harder”. Thanks be to God, Robin, that the Lord was able to break you free of all of that stuff and give you the rest that He has won for you.